First of all, I would like to apologize. This looks horrifying, I know. I realize that this looks like a pizza with some sort of alien sea monster resting on it, or maybe like the baby bezoars on Buffy, but it's too late to do anything about that now. It's kind of growing on me though! Maybe that's just because I ate it, and it definitely doesn't taste like sea monster. Unless you think of shrimp that way, in which case then yes, yes it does, with a lovely grace note of cilantro and chile. I hope not, because what this really is, all appearances aside, is a wonderful pizza with spicy salsa verde, heirloom tomatoes, chiles, and the hugest prawns I could find. It tastes fresh and sweet and vegetal, and if you decide to make this yourself and you happen to own a grill, I want you to promise me you will grill it because the only thing I can think would make this taste better would be a lovely smoky flavor. My oven, limping to 500 degrees, can't quite accomplish that, so please, let me live vicariously. This pizza was inspired by my recent trip to Sydney, where I returned to a restaurant in Manly beach for their pizza and sunset views, only to realize neither was as good as I remembered. The sunset I'll allow was ruined by the weather; for the pizza, there wasn't really any excuse, except maybe my own expectations. I saw a prawn pizza with salsa verde on the menu and assumed I would get something a little more exciting than tiny shrimp scattered over tomato sauce and striped with what tasted like cilantro oil. Maybe they were going for more of a chimichurri, but even so, it was nothing like the vision in my head of crispy flatbread topped with king prawns nestled in a pool of tomatillo salsa. Though, my best attempt to match the vision in my head led to something fit for the Sea Witch's table, so maybe I should go easier on them? You may actually find smaller shrimp to be easier to manage here, since it was a little awkward to bite through the giant shrimp and the pizza dough, and not have the entire prawn come away in the first bite. But I'm still calling for large shrimp below, because I have a vision, you know. Salsa Verde adapted from Skinny Taste. The recipe makes more than enough for one pizza, so you can double everything else and make 2 pizzas, or grab some chips and dig in! 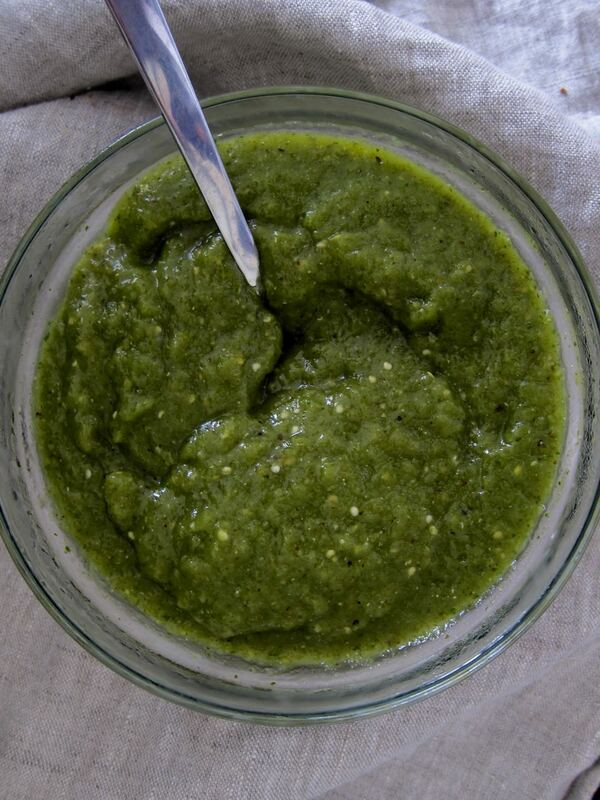 Make salsa: Cut poblano pepper in half lengthwise and remove seeds, and husk and rinse tomatillos, then cut in half. On a greased, foil-lined baking sheet, place poblano halves, serranos, onion, garlic, and tomatillos. Broil 10-15 minutes until charred and softened through. Place peppers in a sealed plastic bag or wrap in foil to steam for 10 minutes, then peel peppers. Remove seeds from serranos if you want the salsa less spicy. Peel garlic. Add all to the bowl of a food processor or blender, and pulse to combine. Add lime juice, salt and pepper, and cilantro. Blend until mixture is combined but a little chunky. Taste for salt and pepper and add more if needed. Heat oven to 500 degrees, preheat a pizza stone or steel if using. Roll out dough into a large, thin round. Spread a thin layer of the salsa verde across the pizza, leaving a 1/2 inch border. Layer slices of tomatoes and peppers across the surface. Transfer pizza to baking stone or steel or bake on a sheet pan in the oven. Cook for 10 minutes. While pizza is cooking, this is a good time to prep your shrimp if you want them to cook without curling, like in the photos above. Cut a few slits in the inside curl of each shrimp and gently straighten. This will allow the shrimp to cook straight, which is probably only important if you plan on replicating the horror of my pizza above. 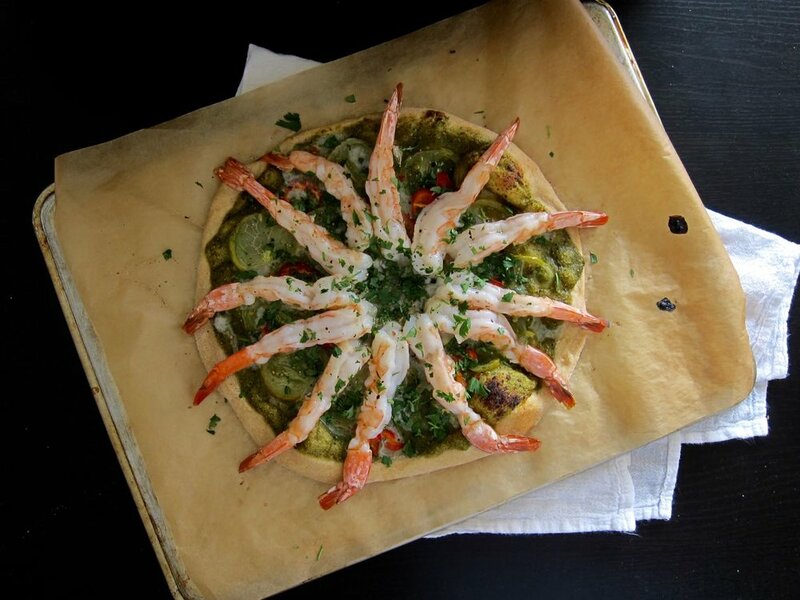 After pizza has baked for 10 minutes, remove from oven and arrange shrimp on top as desired, either scattered across or arranged into a twelve-legged starfish if you're into that. Return pizza to oven and bake for 5 minutes more. Garnish finished pizza with cilantro and serve hot. I like to cut so that each slice gets at least 2 shrimp.